I have been making & eating this porridge for a long time and been thought very weird even by Nutritional colleagues, until recently that is! We now know how amazingly good Turmeric is for us and this is just one easy way to include Turmeric in your diet. You have to enjoy the flavour of Turmeric to enjoy this porridge using the quantity in the recipe, however you could always put in a pinch as it’s still good for you. I also add a grind of black pepper, which helps your body to absorb the beneficial compounds found in Turmeric. 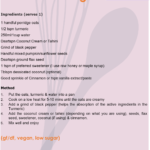 A particularly powerful anti-inflammatory its been found to be beneficial to many body systems. I have given you two options using either coconut cream & desiccated coconut or tahini in place of milk to give the porridge a lovely creaminess. Tahini is also a good source of calcium for those of you who are dairy free. Oats are naturally gluten free, but if you are coeliac or very sensitive look for gluten free oats. I use a small amount of raw honey or maple syrup to add sweetness, particularly when I’m using the tahini as it is slightly bitter. 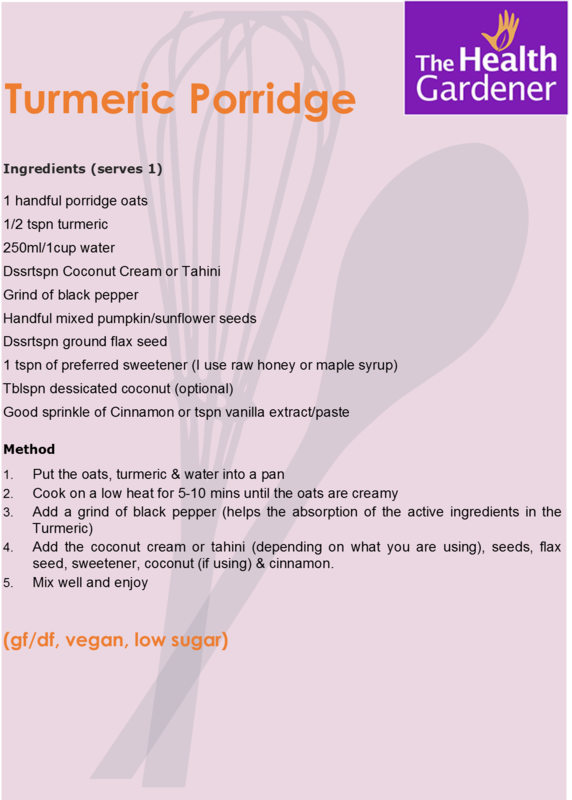 This is a fibre rich porridge which is great for your gut bacteria which can help to combat constipation. Make sure you keep well hydrated when eating flax seeds as they absorb a lot of water.